This powerful workshop offers techniques and tools to improve your client’s ability to get back to living and show them the steps they need to regain positive living. You will walk away with a new understanding of the power of transformative thought and action, and how it can impact the lives of your clients. Ligia Houben, grief and loss expert, will demonstrate tools that can help your clients find meaning, achieve breakthroughs, and learn how to build the life they want on the other side of loss or transition. You will take with you a roadmap that can help your clients cope with the grief that may arise when facing the loss of their job, after leaving their homeland, confronting the death of a loved one, or embarking on a new life after a divorce or break-up. The techniques are simple and systematic, easy to teach clients, and will heal grief and renew life again for the client. The purpose of this seminar is to bring awareness to the clinician in how to help your clients cope with such difficult times in an empowering and transformative manner. Want to transform their loss and transform their lives! Explore different types of loss and utilize strategies to help clients identify patterns within their grieving process. Incorporate the 11 Principles of Transformation® into your clinical practice to help clients reconcile grief and loss. Differentiate between tasks and stages as they relate to the grieving process. Integrate spiritual concepts such as acceptance, forgiveness and gratitude into your work with grieving clients to help facilitate healing and recovery. Teach clients healing rituals including journaling, meditation and affirmations as strategies for coping with loss. Utilize a strengths-based approach with clients to help reframe loss as an opportunity for growth and recovery. Ligia M. Houben, MA, FT, FAAGC, CPC, CHT, is the founder of My Meaningful Life, LLC and executive director of The Center for Transforming Lives in Miami, FL where she consults with individuals and families; offers coaching/support groups and workshops. Ligia is a whole-hearted speaker in the field of grief & loss and life transitions. She has reached many people with her messages about transformation, meaning and personal growth. She is a Fellow in Thanatology: Death, Dying, and Bereavement and a Fellow of the American Academy of Grief Counseling. She holds a BA in Psychology and Religious Studies from the University of Miami, FL in Religious Studies and Graduate Certificates in Multidisciplinary Gerontology from Florida International University and in Loss and Healing from St. Thomas University. Her work has been centered in the area of grief and loss, expanding into meaning and growth. Ligia has a passion for life and believes all of us are able to fulfill our purpose if we can only change our attitude and beliefs. Ligia has conducted workshops and seminars in English and Spanish, in the United States and Latin America. She has appeared on numerous radio and television programs, including CNN Español, NPR, NBC, and Univisiòn. A pioneer in working with Hispanics and grief, she authored the book Counseling Hispanics through Loss, Grief, and Bereavement: A Guide to Mental Health Professionals (Springer, 2011), which has been widely embraced as a helping manual in clinical settings, hospitals, and individuals. This book includes her system of transformation, The 11 Principles of Transformation™ which was introduced in her self-help book Transform Your Loss: Your Guide to Strength and Hope (Insight, 2009). Ligia is also the author of Transforming Grief & Loss Workbook: Activities, Exercises & Skills to Coach Your Client Through Life Transitions (PESI, 2016). Speaker Disclosures: Financial: Ligia Houben is the Founder and Director of The Center for Transforming Lives. She receives a speaking honorarium from PESI, Inc. Non-financial: Ligia Houben has no relevant non-financial relationship to disclose. This activity is designed to qualify for 6.25 continuing education hours. This educational offering is recognized by the Association for Death Education and Counseling to meet the thanatology-related educational contact hour requirements to be Certified in Thanatology: Death, Dying and Bereavement. This course will award 6.25 contact hours to participants. OHIO PSYCHOLOGISTS: PESI, Inc. is approved by the Ohio Psychological Association, Provider #263896894, to sponsor continuing education for psychologists. PESI, Inc. maintains responsibility for this program and its content. PESI is offering this activity for 6.25 hours of continuing education credit. Full attendance is required; no partial credits will be offered for partial attendance. OHIO SOCIAL WORKERS/COUNSELORS/MARRIAGE & FAMILY THERAPISTS: PESI, Inc. is an approved provider with the State of Ohio Counselor, Social Worker and Marriage & Family Therapist Board. Provider approval #:RCST071001. Full attendance at this course meets the qualifications for 6.25 clock hours of continuing education credit. OHIO PARTICIPANTS ONLY: To be reported to CE Broker, while completing the online post-test/evaluation, please answer YES to the question: “Are you an Ohio Counselor, Social Worker or MFT?” and include your complete license number when you are prompted (i.e. C.123234, P.6543, I.159, etc.). After completing and passing the online post-test/evaluation, your information will automatically be sent to cepesi@pesi.com to be reported. If you forget to answer yes, please send an email to cepesi@pesi.com with the following information: full title of the activity, speaker name, date of live broadcast, date you completed the post-test, and your name and your license number. Please allow 3-4 weeks for processing. 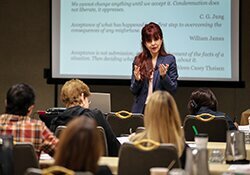 PENNSYLVANIA SOCIAL WORKERS, MARRIAGE & FAMILY THERAPISTS AND PROFESSIONAL COUNSELORS: This intermediate activity consists of 6.25 clock hours of continuing education instruction. Credit requirements and approvals vary per state board regulations. Please contact your licensing board to determine if they accept programs or providers approved by other national or state licensing boards. A certificate of attendance will be awarded at the end of the program to participants who are in full attendance and who complete the program evaluation. Full attendance is required; no partial credits will be offered for partial attendance.